The Esplanade Association’s Sponsor the Park program is a great way to celebrate an occasion, honor a loved one, or simply create a special place for yourself on the Esplanade. Your support will preserve and enhance the Esplanade and demonstrate a commitment to our community. 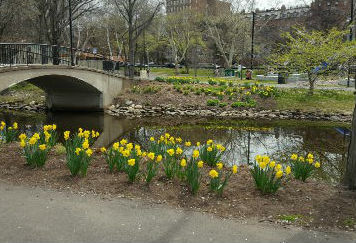 Each year across the Charles River Esplanade, thousands of flowers mark the arrival of spring. Give the gift of renewal and honor someone special by having bulbs planted at the park. With a donation of $1 per bulb (minimum of $25), the Esplanade Association will plant species such as daffodils, tulips, alliums, and lilliums on the Esplanade so that they will grace the park each spring when they bloom. For your donation, you or the person(s) you are honoring will receive a beautiful e-card from the Esplanade Association indicating the number of bulbs planted and the date of the gift, and you will receive an acknowledgment letter. 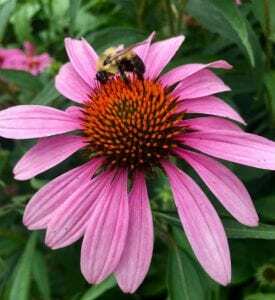 Please Note: Locations for plantings cannot be specified and no plaques will be placed in the park. Bulbs are planted each fall when temperatures drop for the season. Populations of native bees and other pollinators like butterflies, moths, and hummingbirds are declining around the world due to loss of habitat. Without pollinators, you’d have a third less food on your plate, and many fewer flowers blossoming along the Charles River. The Esplanade Association, along with friends like you, is here to help! Your donation will help the Esplanade Association create lush and diverse habitat for our imperiled pollinators while beautifying the park for you and your loved ones for years to come. For your donation, you or the person(s) you are honoring will receive a beautiful e-card from the Esplanade Association describing the native plantings and the date of the gift, and you will receive an acknowledgment letter. Please Note: Locations for plantings cannot be specified and no plaques will be placed in the park. By sponsoring a tree, you help the Esplanade Association care for the Esplanade’s nearly 1,700 trees. 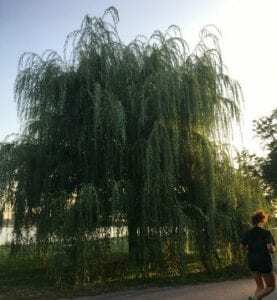 There are a wide array of tree species on the Esplanade, including extraordinary specimens of weeping willow. Your sponsorship gift supports our pruning and maintenance initiatives, which keep the park’s trees healthy and strong. When you Sponsor a Tree you receive a certificate of sponsorship, a photograph of your tree, and a map showing the location of your tree. In addition, a unique metal embossed tree plaque will be placed on your tree. Tree plaques will contain the Botanical and common name of the tree, a donor personalized inscription and year of donation. You can sponsor in someone else’s name, too, making this a unique gift that celebrates a friend, commemorates a momentous occasion, or honors the memory of a loved one. Tree Sponsorships last for 10 years. Donors can double the terms of sponsorship by doubling the contribution. At the end of the sponsorship period, the donor has the opportunity to renew at the then current contribution level. It is the donor’s responsibility to keep the Esplanade Association updated as to their current contact information. Sponsoring one of the park’s 266 historic Shurcliff benches provides a concrete way to underwrite a broader regimen of general improvements and maintenance at the park. 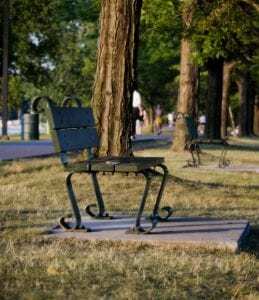 Named for Arthur Shurcliff, the celebrated landscape designer and Olmsted protégé who laid out the park’s original plantings, the historic Shurcliff benches welcome visitors to relax, read a book, or just enjoy the scenery. When you sponsor a bench, the Esplanade Association will install a customized 4 x 6 cast bronze plaque with your personalized inscription on the bench platform to recognize your generous donation of $5,000. Bench Sponsorships last for 10 years. Donors can double the terms of sponsorship by doubling the contribution. At the end of the sponsorship period, the donor has the opportunity to renew at the then current contribution level. It is the donor’s responsibility to keep the Esplanade Association updated as to their current contact information.